CM: It seems that an idea sparks the greater portion of Crisostomos' constructions, which materializes when the proper shell to accommodate it is found. The artist is well aware that time subtracts by adding. Through the passing of time things may loose elements of their perfection, but they grow in terms of charm. The patina of time over things appears to the artist to be like an addendum of sensitivity, feeling and poetry. In his constructions Crisostomo systematically appropriates found materials, when of course these have some character worth perpetuating - well-made furniture, utensils and generally objects of the past (with a special preference for wood), which - though having become obsolete - espouse an interesting history. In any case he manages to adjust every material to his idea and to produce artworks that are original and emotive. In his art Crisostomo transubstantiates neglected materials by endowing them with an invaluable preciousness. Crisostomo's Cenotaph is an original installation, which comprises of two wall-pieces - a wooden vitrine and an old cadre. The vitrine presents in the back of its interior twenty mirrors on the bed of sardine cans, each of which reflects the viewer's face, so long as he stands at a particular distance in front of it. 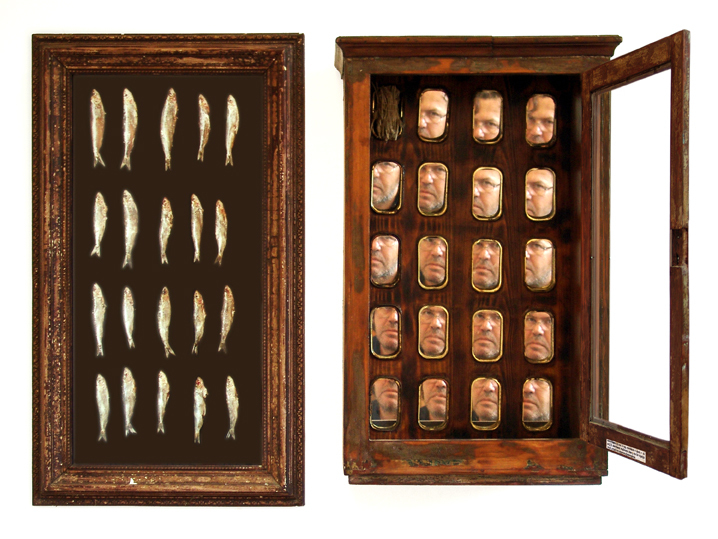 Nearby the vitrine is displayed the cadre with a photograph that represents twenty sardines on a velvet background. The mirrors and the sardines used herewith correspond in numbers. Though their arrangement in the space they occupy varies (the layout of 4x5 and 5x4 depended on the dimension of the elements in the available space) nevertheless they occupy a fairly proportionate area. Regardless of this juxtaposition, the dialog that develops between vitrine and cadre validates the enquiry whether the artist dared to identify the viewer's reflection with the dead sardines. In any case it is worth noting that out of the twenty mirrors the one which is set at the upper left is adorned by a bunch of dried sage. Such a solution brings to mind the following verse from a poem by George Seferis entitled Last Station: "Man is easily ground / he is soft, a bunch of grass". Finally, at the lower center of the vitrine's door is given the following entry regarding the cenotaph: "symbolic grave, which contains no body, monument in memory of a vanished person". The Cenotaph develops the idea of the mirror - for the viewer to behold himself through multiple reflections and his reflection to appear in excerpts. The issue that ensues is the concept of time in relation to the transience of the reflection. The mirror is but a witness that reflects the transient image of the viewer. The palimpsest quality of the mirror - of the image to supersede one another - is so ephemeral and with such refutation of the reflected subject that the matter of life being a game of nature - things falling out rather than coinciding - becomes clear. Before the mirror begins a dialog of man and the transience of his nature. The Cenotaph urges the viewer to consider that the time span that corresponds to his reflection is minimal. In such a thought the viewer is free to shut the vitrine's door, as it is customary to cover the mirror during mourning. The Cenotaph was presented for the first time in a group exhibition at Veroukas' Studio in 2000 in Athens.